← Planes, Tuk-tuks, Song Taus, Vans, Shuttles, Mopeds, Taxies, Boats,and KIDS! Our six year old, Norah, has an interesting arrangement with the Tooth Fairy. For each lost tooth, she alternates getting money with getting sparkled. I would like to interject that while some of Norah’s friends get paper money, (“the green kind, mama!”) Norah gets the silver kind. We expected Norah to lose a tooth in Thailand. But I wasn’t concerned because it was money time. Not sparkle time. I even had a plan to give her a U.S. quarter, Thai baht, and Khmer Riel. Of course she couldn’t eat much with her tooth hanging loose. So, she got sick. And threw up in my cereal bowl at breakfast. In front of the entire resort. And since the kitchen staff didn’t speak English, I wasn’t about to hand them a bowl of puke. I ran to the road and disposed of it in a public trashbin. Then returned the bowl to the kitchen. Gross. Scott and I sat Norah down and gave her dire threats and warnings if she didn’t pull the tooth. We may have mentioned feeding tubes. I mean, as a homeschool lesson. Education is important. Regardless, she FINALLY pulled the tooth. And happily announced just before bedtime that she had decided to be sparkled instead. We’re in a remote beach town community whereabouts in Thailand. Where am I going to find glitter?? Around 11pm, I ventured into the dark resort dining room to make a press of coffee. And I look around. I see Christmas decorations. I see seashells covered in silver glitter! Hmmmm. I rummaged around the dining hall and found a stash of glue and glitter! What are the chances? Then the night security guard busted in to see what I was doing. I smiled and waved gesturing to the glitter. He didn’t speak English either. 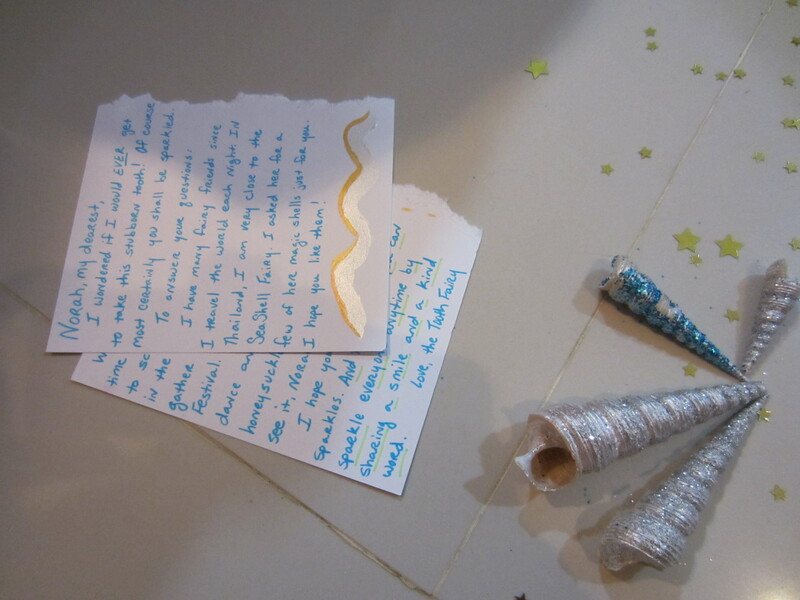 Back in my room, I covered some of seashells I found earlier that day with glitter as a tooth fairy gift. Then I carefully painted glue/glitter fairy footprints on Norah’s arms and cheeks. And sprinkled gold star confetti from the craft stash around her covers and floor. And certainly, I left a note from the tooth fairy. She was thrilled. All was well. The tooth was gone, the day was saved. Her appetite returned. My cereal bowl was safe. I’m sorry about the puke story. I really wanted you to feel how this tooth was affecting our vacation. While gross, I maintain its relevance. Posted in Family, Parenting. Bookmark the permalink. I should have done that. Scott pointed out that my handwriting was way too recognizable. And he is right. Norah is a smart-cookie.